The new Marlins Park gives baseball fans and families a good reason to take a trip to Miami and enjoy the great American sport. Of all the sports played in the United States, baseball is one of the oldest national sports that still continue to bring people together for the love of the game. Our first impression as we got our first glimpse of the stadium was, “It’s beautiful.” And like all things exceptional, its ingenuity is in the details. After the initial wow of the modern building design of the Marlins Park, another noticeable trait is friendly service. This might not mean much to some, after all, you’ll be watching a baseball game where the focus is on rooting for your team to win. But when you realize that from the parking attendants to the ticketing booth to the employees inside are all so friendly and helpful from giving directions to finding seats, then it makes the experience even more pleasant. Alex Buznego*, Digital and Social Media Manager for the Miami Marlins, mentioned that all of the stadium’s employees go through quality service training given by the Disney Institute. Aha, now it makes sense. No, there are no employees wearing mouse ears (the team has its mascots) but the feeling that you’re welcome is pretty much everywhere. Think of a ballpark and the image that normally comes to mind is an open air, ring or jewel box-shaped structure that’s been the standard for years. But Miami’s ballpark changed all that. It said no way to the retro look and true to South Floridian bold and daring, the city built an architectural wonder. From the outside it looks like, and I know it sounds like a cliché, it looks like a spaceship. And it’s pretty exciting to feel like you’re entering a spaceship to watch a Marlins home game. Gleaming and bright on the outside, inside the park is sleek and open with hangout areas near food and beverage merchants. The Budweiser Balcony is the area to go if you want to have a more social experience with friends and family and enjoy a great view of the game without sitting in a row of seats. These areas get crowded; you’ve been warned. Bring a hungry appetite because you’ll find a lot of choices that reflect the city’s Latin influence. Rest assured, there are hotdogs and Cracker Jacks for the baseball food traditionalists. But for the foodie adventurer, you can dig into Miami shrimp burgers, chimichurri steak sandwiches and Key lime chicken tacos, just to name a few. Special-diet friends will appreciate the kosher or gluten-free choices and out-of-this world fresh, tropical fruit shakes. There is also a section especially designed with kids in mind with lower counters and kiddie-friendly food choices. The best part is that all of the food merchants are local mom-and-pop businesses who truly highlight the very heart and culture of Miami. Even the pizza place is local! Ok, I’m going to have to stop talking about the food, my mouth is watering already. And you’ll find that art is everywhere in this stadium. Baseball and art, you say? Sure, why not? Here are a few examples. History meets art with Daniel Arsham’s tribute to the Miami Orange Bowl, which used to stand on this very site, with what looks like the tumbled down letters of the previous stadium now serving as art pieces on the East Plaza. 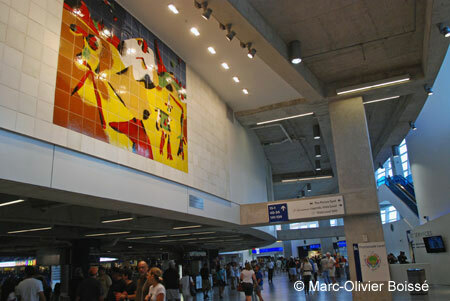 Painted ceramic tiles by Spanish artist, Joan Miro, greet fans as they enter the Home Plate Entrance. Baseball influenced artwork by Kenny Scharf and Roy Lichtenstein adorn different sections of the Promenade Level of the stadium. 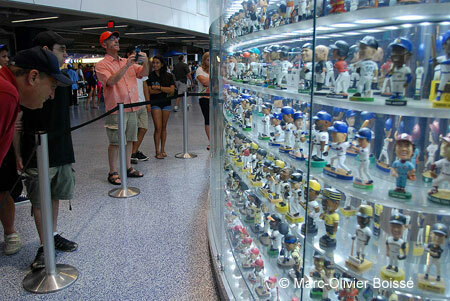 Then there’s the quirky Bobblehead Museum that displays bobbing head figures from every MLB team. Although not exactly considered an art piece, the two 20-foot long tropical fish aquarium behind the home plate is a sight to see if you can. The main piece of art is the bright and colorful Home Run Sculpture installation by Red Grooms that lights up, complete with jumping marlins and water splashing every time the Miami Marlins hits a home run. Some might find it over the top but when the Marlins hit a home run, you want to celebrate it in unique Miami style. Families get their own day at the park on Sunday home games. There are pre-game activities and a special Diamond Dash when kids 12 and under can run the bases on the field after the game. There’s also the Billy’s Bunch Kid’s Club that’s free for South Florida residents (woo hoo!) or if you live outside of the area or even outside the state, there’s a very reasonable annual fee. Budding baseball enthusiasts get cool giveaways and special offers. Lucky! 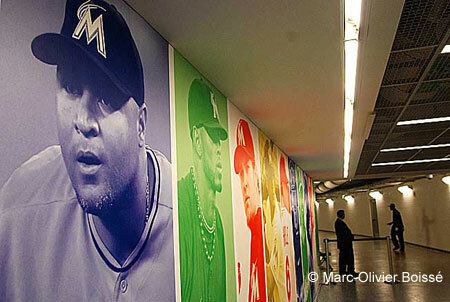 These exclusive areas at the Marlins Park are upscale, luxurious and best reserved for private and business entertaining. The Diamond Club is the crème de la crème located just behind the home plate, gorgeous and all inclusive. There are other areas such as dugout clubs and suites that will give you the best views in the house. Of course, it also comes with an exclusive price. The park also invited South Beach over and famous The Clevelander set up shop complete with swimming pool and club atmosphere. The field view is fantastic, too. If you’re over 21 and enjoy the party crowd, this is the place to be. This alone will invite more crowds. Yes, we will swelter in the South Florida heat or a tiny bit of drizzle to cheer our team on, but a retractable roof makes all the difference. All of a sudden you’re no longer melting in the summer or hoping that it won’t rain. With the roof covered, there are more chances that people will stay or even come to begin with. Climate control keeps the temperature inside mild and comfortable. When the weather is gorgeous the roof retracts and it can double as shade for the west plaza where music events take place after games or other events. When the roof opens, the giant sliding walls open along with it to give you an even better view of the Miami skyline from inside. 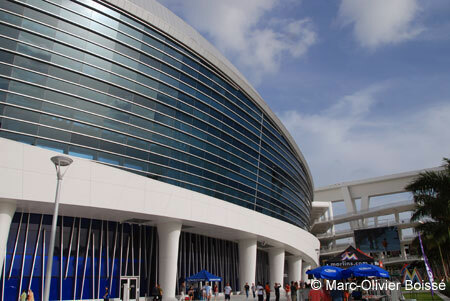 Not only that, the Marlins Park is a LEED Gold certified building. Not only is it cool, it’s green too. How many can say that the action of opening or closing the retractable roof only requires $10 in energy costs each time? Geesh, ten dollars will barely get me three gallons of gas for my car nowadays. Obviously, reading about Marlins Park won’t give you the full effect of actually being there. 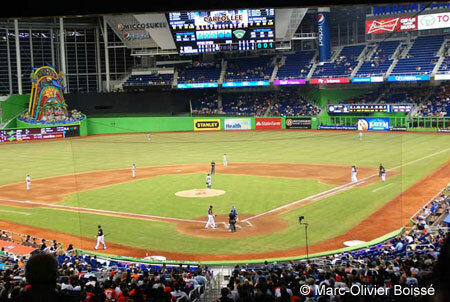 The best way to experience it is, of course, to go see the Miami Marlins play in one of the home games. But baseball season lasts from about April until the end of September so another way to go is to sign up for one the tours. $10 a person is a great price for an in-depth look at this marvel. Most everyone knows that soccer is hugely popular, and here in the United States, more and more people are beginning to fall in love with the game. In South Florida, it’s the common ground sport for its population that can boast roots from probably every single country in the world. 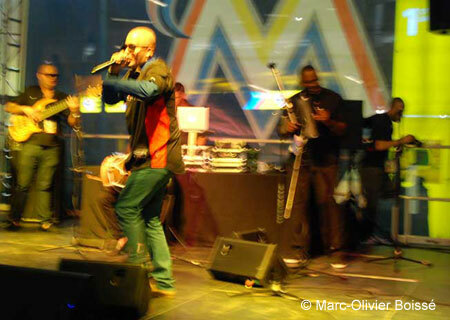 In January 2013, the Marlins Park will host the Miami Soccer Challenge with North American and European teams competing. The three-year agreement with the Global Soccer Challenge will definitely attract huge crowds from all over. Mark the date and join the fun! If you want to park in the garages closest to the stadium, make sure to buy your parking pass online before getting there. Trust me on this one. It may be more expensive but worth it. There are other partner parking sites that are anywhere from a couple of blocks to about a mile away. Prices vary, again with the closest ones priced almost the same as the stadium garages at about $20 or so. The lots that are further away will be priced about half that and you would need to walk or take public transport to get to the stadium. *Many thanks to Alex Buznego, Digital and Social Media Manager for the Miami Marlins, who was gracious enough to give us a tour of the Marlins Park and provided supplementary details. Also special thanks to Jennifer Valdes from RBBPR for making the tour happen in the first place. 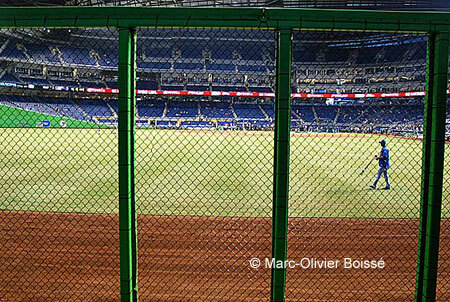 Go to Marlins.com to find out everything you want to know about the Miami Marlins and the Marlins Park. More pictures of Marlins Park.